2000 AD REUNITES WITH TITAN BOOKS! This move marks a return to its roots for Titan, whose first ever publication was a Judge Dredd collection back in 1981. Jason Kingsley, C.E.O. of Rebellion - the Oxford-based games developer who purchased 2000 AD last year - says: "Combining forces with Titan will take our graphic novels to the next level of success. Titan's long association with 2000 AD gives them invaluable editorial and commercial expertise - they know these titles inside-out. It's a smart move, and an important step in making 2000 AD a globally-recognised brand." 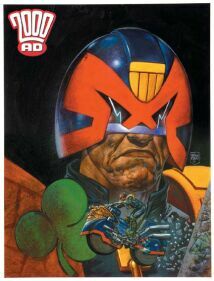 Titan Publisher, Nick Landau, says: "There is no better way for Titan Books to celebrate its 20th birthday this year than in welcoming Judge Dredd and 2000 AD back to the fold. These characters feel like family to us, and we're delighted to be publishing some old favourites as well as some brand-new material. I'm full of admiration for the dynamic plans Jason has for the future of 2000 AD, and glad to be able to play an important part in those plans." The graphic novel series will launch in July with two exciting titles: The Complete Ballad of Halo Jones, the 2000 AD classic by Alan Moore and Ian Gibson; and Judge Dredd: Emerald Isle, a never-before-collected storyline by Preacher creators Garth Ennis and Steve Dillon, featuring a new cover by acclaimed Preacher cover artist Glenn Fabry. For more information, please feel free to contact Andy Diggle on (020) 7357 0130 or email Andy@2000ADonline.com.